Yandere is one of anime archetypes. Yandere is in love (usually a boy) and is ready to go to anything to be near him. And I mean ANYTHING. Yandere is love brought to the point of absurdity. Usually, the stories associated with yandere do not end well, often it is unrequited love with a tragic (and bloody) finale. Usually this girl is in love with a boy, this is her first and last love. Once having chosen the object of her love she will never change it. She will do anything to be with the object of her insane love. Yandere can either be born as she is or become. If a girl, initially normal, becomes a yandere, it happens because of a strong mental disorder. Yandere - a psychotic, with what is incurable. Yandere can be happy only next to the object of his love, especially if this love is mutual (which usually does not happen). But even in this situation, the yandere will constantly be engulfed by paranoia and jealousy, so that, as a rule, the yandere can never be happy. Usually, yandere is also a "stalker", someone who constantly follows and persecutes someone. Yandere does not care about the feelings of the object of his adoration, it does not matter who he loves or what he wants. So yandere can get to kidnap and keep the object of his love locked. And of course the most popular and obvious feature of any yandеre - blood. Yandere is a murderer. If yandere are not killed anyone, well, it's probably not yandere. As a rule, yandere uses cold steel, especially knives. Victims yandere can become all who somehow threatens her closeness with the object of her love. Rivals, parents (her and him), friends - anyone. 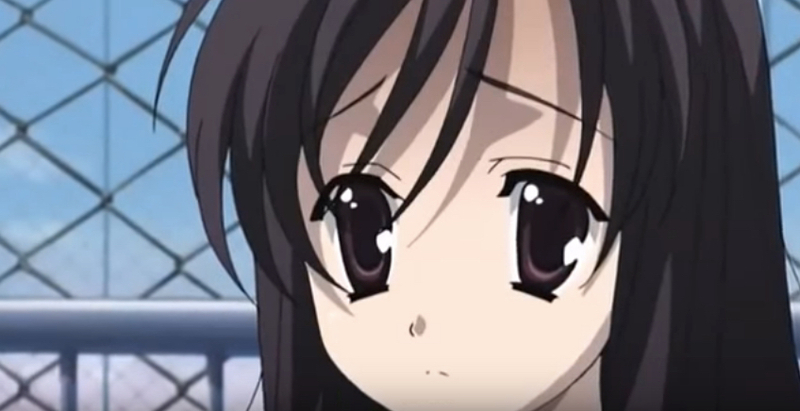 In this case, the main victim of the yandere is the object of her love, because he does not give him any choice at all. He SHOULD be with her and only with her, without options. 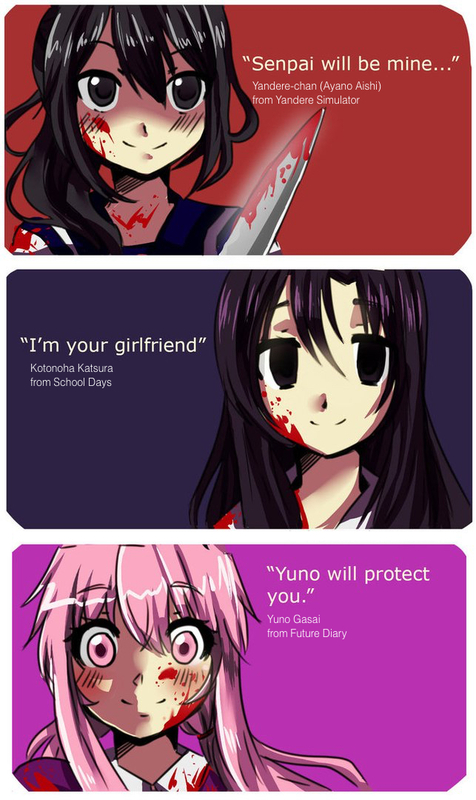 The two most famous yandere: Kotonoha Katsura from School Days (anime and game) and Gasai Yuno from anime Future Diary. Kotonoha Katsura- сonsidered first yandere. She is notable for the fact that at the beginning of the story she is not at all like yandere. At first, it's just a nice, shy girl. Just she was very unlucky with the first love. Eventually, her psyche breaks down and she falls into insanity. Kotonoha is considered the first yandere, but it can not be called a "standard" yandere, since in the story told in the anime Kotonoha is one of the victims. 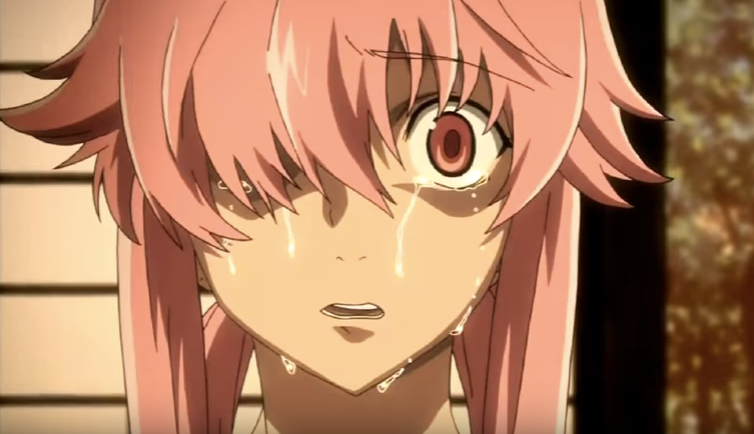 Gasai Yuno - If Kotonoha is the first yandere, then Gasai is the most classic yandere. The way she behaves and acts is a model for imitation of any yandere. As a rule, when someone talks about yandere, he means exactly Gasai Yuno. She will do everything to be near her love, and no matter how many people have to cut an ax for this. Particularly curious is the eighteenth series of the series, where the Gasai interferes with the date. In this series there are a number of elements familiar to us on the "Yandere simulator".